I admit I have a favorite jigsaw puzzle, saved from my children’s growing-up years. It has 300 extra-large pieces and features lots of friendly Disney characters. It’s just complicated enough to give me a mental workout, but just simple enough to keep me from turning into a nervous wreck. It can be done in an hour or so, but I wouldn’t dream of timing myself. That would spoil the fun. I just saw a new film, though, in which jigsaw puzzling provides a lifeline for a repressed woman who badly needs something new in her life. 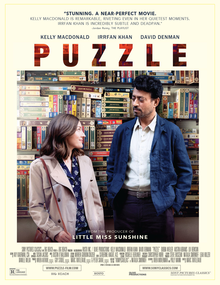 Puzzle, a small indie made by Hollywood veterans, provides Scottish actress Kelly Macdonald (I’ll never forget her film debut in Trainspotting!) with a quiet but complex role that makes great use of her appealing presence. 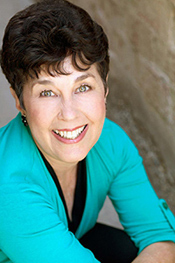 In the film, she’s Agnes, wife to a suburban mechanic, mother to two grown sons, baker of birthday cakes (even for herself), and a pillar of the local Catholic church. Her husband adores her in her happy homemaker role, and is quick to tell the world how “cute” she is. We sense, though, that something is missing. She’s so used to being agreeable that her own opinions are never voiced. Her unlikely evolution begins when she tears open a plastic bag containing the 5000 pieces of a brand-new jigsaw puzzle, someone’s casual birthday gift. Agnes discovers in herself a talent for pattern, color, and shape that allows her to quickly solve the puzzle – and feel a sense of personal accomplishment she’s previously never known. Then, on a stealthy trip into New York City to visit a puzzle store, she finds herself drawn into the world of competitive puzzling (who knew there was such a thing?) and her life is changed forever. Her unexpected new puzzle partner is veteran Indian actor Irrfan Khan, playing a man who’s everything she’s not: wealthy, educated, cynical, and from a faraway land. His long list of time-tested puzzling strategies immediately clashes against her own much more intuitive approach. But as they hold practice sessions for the big competition she’s still keeping secret from her family, their relationship blossoms in unexpected ways. Yet in some respects the relationship that most fascinates me is that between man and wife. Husband Louie, played by the burly David Denman, is convincing as a good-hearted blue-collar guy who loves his wife but believes it’s his job – as a male and the household’s sole provider – to make all the big decisions without consulting her. Lacking much ambition himself, he can’t see that his wife and his eldest son are restless for new challenges in worlds he knows nothing about. Ultimately Agnes reveals to him (and to herself) how much she’s changed, in an ending that is both surprising and completely satisfying. It took me a while, after the house lights came up, to see the connection between Agnes’ psyche and that of one of literature’s most classic heroines. In the 1879 drama, A Doll’s House, Henrik Ibsen’s Nora, -- of a much higher social class than Agnes and Louie --is an adored little “wifey” whose function in her household is primarily to be ornamental. When she dares to act on her own, we can figuratively say that the roof caves in. Nora’s third-act exit from her comfortable life proved to be a door-slam heard ‘round the world. Agnes slams no doors, nor does she make any big speeches, but her final action is her own quiet declaration of independence. Where it will finally lead her we’re not sure, but I for one am firmly on her side.